Idaho Chicken Ranch: The Ducks are Off to Rose Bowl! 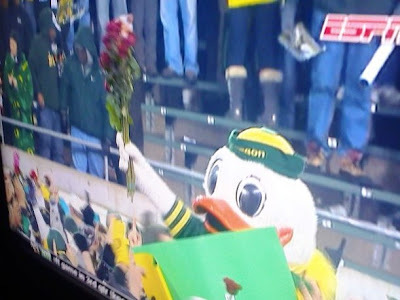 OK, so this isn't the timeliest posting, but I did want to take a moment to observe the Ducks upcoming trip to the Rose Bowl! Whoo-hoo!! 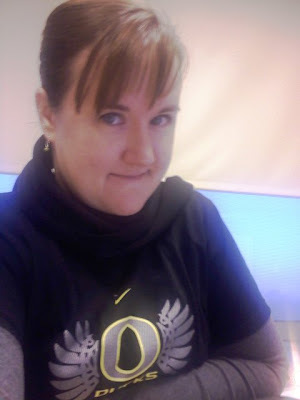 I was pleased to have acquired a new "winged logo" t-shirt on a recent trip to Portland. I generally don't engage in too much ribbing...after all, some of my closest friends are Beavers! ;) But there are a couple of Beavers at work who just can't take the high road, and have to start in with the snotty emails and the "Man, that's an ugly t-shirt!" So Friday morning after the game I popped by Albertson's looking for yellow or green cupcakes or cookies... or...hey! Look! Yellow roses... PERFECT. Each of the snotty Beavers found a yellow rose on their keyboards that morning. Hee hee! Go Ducks!